Zion Market Research has published a new report titled “Viral Vectors and Plasmid DNA Manufacturing Market by Product Type (Viral Vectors (Retrovirus, Lentiviruses, Adenoviruses, Adeno-Associated Viruses, and Others) and Plasmid (DNA Conjugative Plasmids, and Non-Conjugative Plasmids)), by Application (Gene and Cancer Therapies, Viral Infections, Immunotherapy, Formulation Development, and Others), and by End-User (Biotechnology Companies, Research Institutes, and Others): Global Industry Perspective, Comprehensive Analysis, and Forecast, 2018—2026”. According to the report, the global viral vectors and plasmid DNA manufacturing market was valued at approximately USD 340 million in 2017 and is expected to generate revenue of around USD 1860 million by 2026, growing at a CAGR of around 20% between 2018 and 2026. The viral vectors and plasmid DNA manufacturing normally comprises the use of panomics and system biology to regulate the source of a patient's disease at the molecular stage along with the use of determined medicines to address the patient's disease. Furthermore, viral vectors and plasmid DNA help in reducing the price of management and support to decrease the recurrent medication dosage. The growing prevalence of life-threatening diseases, such as cancer, rising geriatric population, and the growing demand for personalized medicines are anticipated to propel the viral vectors and plasmid DNA manufacturing market in the future. Moreover, increasing government grants and initiatives and rising funding by private players for research and developments activities in the viral vectors and plasmid DNA manufacturing are anticipated to further drive this market over the forecast timeframe. The viral vectors and plasmid DNA manufacturing market are fragmented into product type, application, and end-user. By product type, this market is segmented into viral vectors and plasmid. The viral vectors are further segmented into a retrovirus, lentiviruses, adenoviruses, adeno-associated viruses, and others. The plasmid segment includes DNA conjugative plasmids and non-conjugative plasmids. Viral vectors held the largest share, i.e., 80%, in the market globally in 2017. It is also expected to register a growth rate of around 21% over the forecast time period. Adeno-associated viruses held more than 30% in 2017 in this global market. Alternatively, lentiviruses are likely to register A CAGR of 27.3% from 2018 to 2026, owing to their rising application in cancer treatment. By application, the viral vectors and plasmid DNA manufacturing market for viral vectors and plasmid DNA manufacturing are segmented into gene and cancer therapies, viral infections, immunotherapy, formulation development, and others. The gene and cancer therapies held a 70% share of the global market, due to the rising prevalence of cancer. Immunotherapy is expected to register a significant CAGR in the future, due to the development of newer drugs. By end-user, the market is segmented into biotechnology companies, research institutes, hospitals, and others. Research institutes held the largest market share in 2017 globally, due to the increasing research and development activates for various chronic diseases, such as cancer. In terms of growth rate, biopharmaceutical companies are estimated to register good growth in this global market, owing to the increased spending on R&D. By geography, the viral vectors and plasmid DNA manufacturing market are divided into Asia Pacific, Europe, North America, Latin America, and the Middle East and Africa. North America and Europe are estimated to remain the leading regional markets over the forecast time period. Asia Pacific is anticipated to register a growth rate of 23% from 2018 to 2026 in the viral vectors and plasmid DNA manufacturing market globally. 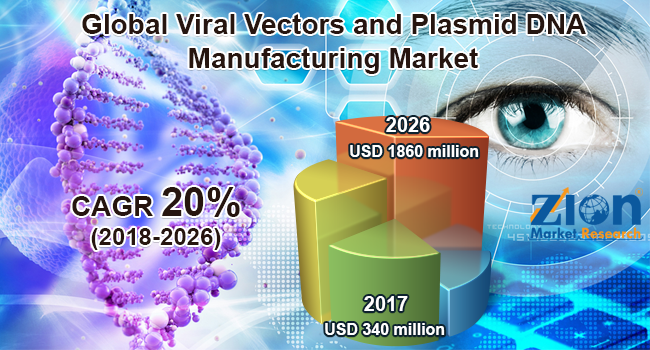 Some key players of the viral vectors and plasmid DNA manufacturing market are Vigene Biosciences Inc., Lonza, FinVector Vision Therapies, Kaneka Corporation (Eurogentec), VGXI, Inc., VIROVEK, SIRION Biotech GmbH, Cobra Biologics, Novasep, FUJIFILM Diosynth Biotechnologies Inc., Spark Therapeutics, Inc., Genzyme Corporation, ALDEVRON, Brammer Bio, Oxford Gene Technology, and General Electric Company (GE Healthcare), among others.